Is the 'World’s Deadliest Tank' Bankrupting Russia? Moscow is overspending on its armed forces and still might not get the military it wants by 2020. Russia is expected to spend more money on its military in 2015 than in any previous year in its entire post-Soviet history. According to an analysis conducted by Forbes Magazine, Russia will spend an estimated 5.34 percent of its economic output on defense in 2015. This estimate is based on the assumption that the Russian economy will contract by 3 percent and a 15 percent hike in the real value of the military budget. However, another estimate quoted in the Wall Street Journal based on Russian government data notes that country’s GDP may even decrease by 4.6 percent largely due to lower oil prices and Western sanctions. Consequently, Prime Minister Dmitry Medvedev recently announced that this year’s 3.3 trillion rubles military budget will need to be adjusted and cut by five percent or 157 billion rubles. Even worse, according to newly published budget data of the first three months of 2015, military expenditure exceeded 9 percent of quarterly GDP – almost twice the amount cited in Forbes Magazine. The verdict is simple: Russia cannot afford military expenditures at such scale in the long-run. “The modern Russian economy just does not generate enough resources to finance the current 2011-2020 rearmament program. This seriously reduces the ability to efficiently renew the Russian armed forces’ equipment,” a recent analysis by the Moscow-based defense think tank CAST notes. The only way for Russia to currently finance its growing military expenditure is to tap into the country’s reserve fund – money the Kremlin put aside over the last few years when oil prices were high and meant to cushion the economy against shocks. With the help of the reserve fund – worth approximately six percent of the country’s total GDP – Russia could maintain a 3.7% deficit for less than two years, according to the economist Sergei Guriev. 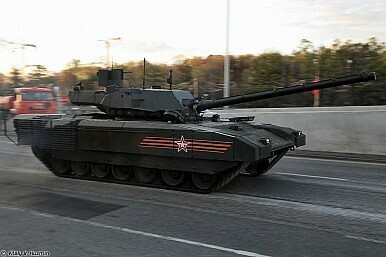 By 2020, Russia plans to produce 2,300 T-14 Armata models. Each tank costs about $ 8 million. The Russian military intends to replace 70 percent of its tank corps with the new tracked vehicle, replacing the older T-72 and T-90 main battle tanks. Overall, Russia military spending plan called for the modernization of 30 percent of the armed forces’ weapons this year. Back in 2010, President Vladimir Putin launched a massive 20 trillion rubles military modernization project aimed to replace 70 percent of Soviet-era military hardware by 2020, including 50 new warships for the navy, hundreds of new fighter jets and thousands of new vehicles for the ground forces. Is Russia's ‘Deadliest Tank’ Cheaper Than European and US Armor? The T-14 armored platform is cheaper than Western analogs, the Russian defense industry claims.